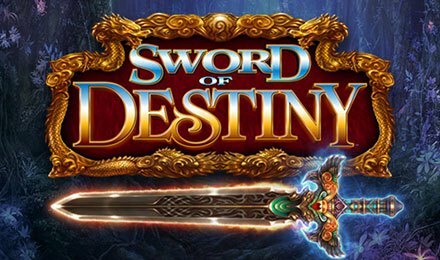 Sword of destiny by Scientific Games comes packed with 5 reels and 25 paylines. Join the combat on this amazing slot grid, where you get to collect amazing bonus rounds and cash prizes. As you spin the reels of this slot, come across symbols like: Sword Man, Sword Lady, Flasks, Gloves, Necklaces, Scrolls, Evil Knights and Castles that combine on the reels to trigger wins! Use the plus or minus buttons on the bottom right of the screen to adjust your stakes. Use the Autoplay option to your advantage, which allows you to set a sequence of automated spins to play! Coin Values: Stakes range from £0.40 to £360.00. The wild of Sword of Destiny slot is the Sword, which replaces all other symbols to help complete winning combinations. This takes the place of all other symbols, except for the bonus symbol. There are two bonus symbols which are the XZone and Glowing Coins. Each of these triggers a special bonus round of their own. Three, four or five scatter symbols anywhere on the reels trigger 8 free spins. On this feature, all wins are subjected to a 10x multiplier. Every scatter symbol landing during the play of the feature, awards extra spins. Clumped Wilds: Up to three reels are filled with the expanded wild sword. Random Wilds: From four to nine positions are turned wild on the reels. Picture Wilds: Large wild symbols cover adjacent wilds. Ungraded Symbols: At least two lower value symbols are upgraded to high value symbols. The Temple Tower Jackpot is accessed when the Bonus Symbol appears on reels 1, 3 and 5 on the reels at the same time. You’re then presented with a 16-step ladder, where you can win cash prizes and three fixed jackpots. Make picks in order to win these prizes or jackpots, the higher you climb, the bigger the prize. Enjoy Sword of Destiny slot at Wicked Jackpots Casino, where you could stand the chance to trigger a smashing jackpot! Launch the game on your mobile, desktop or tablet, and win big!